LG M2550D-PZ review and specifications. LG M2550D-PZ is a 25"-inch ultra slim LED TV monitor with FULL HD capabilities. 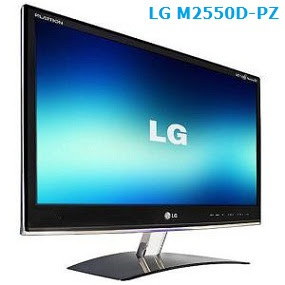 LG M2550D-PZ is part of the LG's M50D Series 22, 23 and a 25-inch monitors. LG leads the evolution of monitor TV with the new M50D. Its beautiful vivid picture quality with superb contrast ratio is matched only by its slim design. It is optimised for various digital broadcasting formats such as MPEG4, DVBC, DVBT, FHD and more. And it also plays media files without a PC through a USB port. Take a glimpse into the future of monitor TV through LG’s new M50D, and witness what lies beyond technology. M50D Series is a stylishly designed premium LED LCD monitor TV. Compared to normal LCD, LED offers various features including true-to-life pictures supported by Mega Contrast Ratio and a stylish design much slimmer and lighter increasing space efficiency. Free of hazardous materials, LED is an eco-friendly technology that contributes to preserving the environment by reducing energy consumption and heat generation. M50D supports full HD (1920x1080 pixel) resolution for never-before-seen clarity and sharpness. With details closer to real life, it provides advanced quality that used to be impossible with existing SD images. Enjoy real viewing pleasure with full HDTV through M50D’s built-in DTV tuner that supports MPEG4, DVBC, DVBT, and other digital TV broadcasting standard signals! The monitor’s built-in Quick View HD Play function frees you from having to boot your computer to view video clips and pictures or listen to mp3 files. The function enables the instant playback of video clips stored on USB memory devices by simply connecting the USB to the monitor. The M50D’s Mega Contrast Ratio clearly distinguishes the brightness and darkness. It adds light and shade for a richer visual experience. LG’s Surround X maximizes the reality of entertainment contents by delivering vivid 3D sound. By reproducing crisp and vivid human voice, Surround X brings life into the experience of watching movies and TV shows, playing games, and listening to music. A soft violet light glows whenever the monitor is on, to give it a luxurious look. M50D has lightning-fast response time of 5ms, enabling the reproduction of crisp images even when playing back fast and dynamic video clips. Enjoy speedy and dynamic online games, action films, and sports without any fuzziness or afterimage. The multi-function of M50D is contained in its 16.8mm slim design. The highly glossy black surface makes its refined look. M50D's eye-catching design artfully merges the flat front and gently curved back panel into an elegant monitor that meets your expectation every time. - Experience deeper blacks and richer colors. Worrying about dark scenes is a thing of the past. - The mega contrast ratio of 5,000,000:1 delivers vivid colors and deep blacks. - Memories brought to life. Now reliving that fantastic family vacation can happen from a flash drive. Easily connect your external USB devices to enjoy JPEG photos or listen to MP3 files. - Prepare to be dazzled. Want deeper blacks and richer colors? LG’s LED technology provides even greater control of brightness and delivers better contrast, amazing clarity and color detail, as well as greater energy efficiency compared to conventional LCD Monitors. - Double the detail. This stunning picture is the reason you wanted HD in the first place. With almost double the pixel resolution, Full HD 1080p gives it superior picture quality over standard resolution. You’ll see details and colours like never before. - HDMI Input make your monitor a multimedia centerpiece and let you easily and conveniently connect your other digital devices. A single cable connection means no more confusion, no more mess. 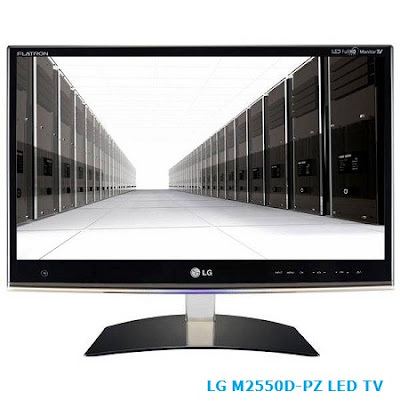 - LCD Screen Size 63.5 cm 25 "
Currently the LG M2550D-PZ could be found in online stores for about 280$ (170£ in UK).